There was a time when flavouring your bait involved nothing more technical than smearing a bit of honey on a piece of bread flake. These days, bait additives are produced on a grand scale by a multi-million pound industry. Drawn from real edible products, these liquids are loaded with natural proteins, including amino acids. Aminos are the organic substances that animals recognise as being a signal leading to food. Put simply, if they locate the source of amino acids they know that item is edible. Although natural extracts are not as concentrated as many artificial flavours and can be used at higher dosages, they still deliver a potent attraction. They can be added to pellets, mixed with water for use with groundbait or used as a soak for hookbaits to be left sitting in. Although these liquids were first developed for use in boilies by specimen carp anglers, they are great products for tempting almost any fish that swims. Some of the best are pictured. SUGGESTED RECIPES: Add 20ml-50ml of Nash Pure Liver Extract, Nutrabaits Nutramino, Corn Steep Liquor, Bag ’Em Matchbaits Molasses to the mixing water added to every kilo of dry groundbait. Extracts can also be used undiluted as a soak for hookbaits like corn, boilies, meat and pellets. These are chemical liquids that have been developed to mimic the smell and taste of different foodstuffs. There are literally hundreds on the market and they can be used to customise baits, giving your offering a unique appeal. Hutchinson’s and Nash’s Chocolate Malt is a classic, as are Nash’s Scopex and Strawberry. Pineapple flavours, like Mainline’s and Solar’s varieties, are also among the favourites. But here’s a word of warning; these flavourings are very strong – often boasting a 1,000-1 concentration level – so you need to use them very sparingly. Half to one teaspoonful of flavour (2.5-5ml) is more than enough to boost a pint of pellets or a kilo of groundbait. Do not make the mistake of piling more artificial flavour into your bait on the basis that more flavour equals more bites – it doesn’t. Coarse fish have a sense of smell and taste that is hundreds of times better than ours and they can detect microscopic amounts of a chemical dissolved in water. Fish may even be repulsed by a bait that smells too powerful. If you are using strong artificial flavours your bait should carry a mere whiff of scent rather than a stench. A good edge over anglers who are only flavouring their baits is to add a touch of flavour enhancer or sweetener to your bait, too. This ensures that your bait doesn’t just have a distinctive smell but also has a pleasant taste. Lots of firms make products that do this job with Solar’s Liquid Candy Sweetener and Nutrabaits’ Sweet Cajouser being among the most highly reputed. SUGGESTED RECIPES: Blend 2ml of sweetener with 2.5ml- 5ml of flavour (per kilo of pellets/groundbait or pint of maggots/corn). Some bait firms have produced powdered bait additives which make up part of the mix itself and release attractors slowly, over a long period of time. Van den Eynde’s Brasem powder is a classic. Sweet and intensely creamy, it is a marvellous ingredient that bream, carp and tench seem particularly attracted to. VDE’s Bloedmeal power is loaded with savoury/meaty attractors that can really give your groundbait a special appeal. Tench and carp love the stuff. Ground turmeric is also a great additive if you want to try a spicy mix for carp and, if roach are your number one target, track down some powered coriander. Why they like it so much nobody knows – but it works. SUGGESTED RECIPES: Usually, add 2-4 desert spoonfuls of powder to a kilo of dry groundbait. Some powders are very strong, so be careful not to overload the bait. This family of flavours is probably one of the most misunderstood yet they are also very useful for anglers who just wish to boost their baits without spending a fortune on blending different potions. 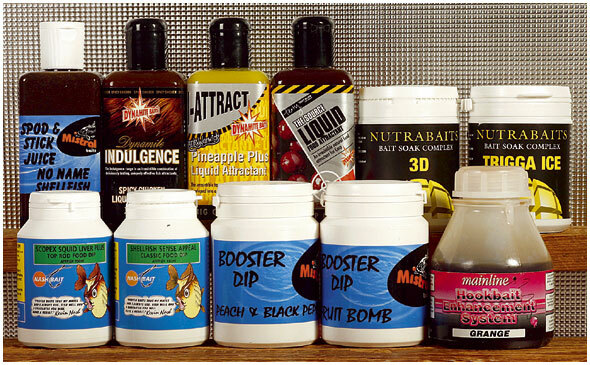 Variously labelled bait soaks, dips or glugs (you ‘glug’ your bait in these syrupy liquids), they were first designed by carp bait firms to boost boilies. But they have transferred across to the coarse fishing market where they’re used by some of Britain’s best match anglers. So, what are they? These are blends of several different attractors that are fused into one potent liquid that smells good, gives a bait an improved taste and boosts it’s food signal. In differing quantities they usually contain flavour, taste enhancer/ sweetener and natural extracts. While this means they are concentrated and do have a strong smell/taste, they can be used more liberally than a neat artificial flavouring. Dynamite Baits produce a huge range of these attractors. Some, like the Pineapple Attractant, are heavily flavoured but others, like Source and Spicy Chicken Attractant, contain lots of natural extracts and can boost any bait. Nash also produces a fabulous range of bait soaks under its Food Dip banner, with the Squid Scopex and Shellfish Sense Appeal having natural extracts with a dash of flavouring. Mainline’s Hookbait Enhancement System range also marries flavours with powerful natural fish attractors and both Mistral Baits’ Booster Dips and Bag ’em Matchbaits Natural Attractor liquid will boost your hookbait. Nutrabaits’ Bait Soak Complex range is top quality. SUGGESTED RECIPES: Typically, 10ml-20ml (two to four teaspoons) of glug can be added to the mixing water for a kilo of groundbait or pellets. These liquids can also be used as an overnight marinade for your soft pellets, boilies, corn or meat. The number of flavours and bait enhancers available to the angler is huge. 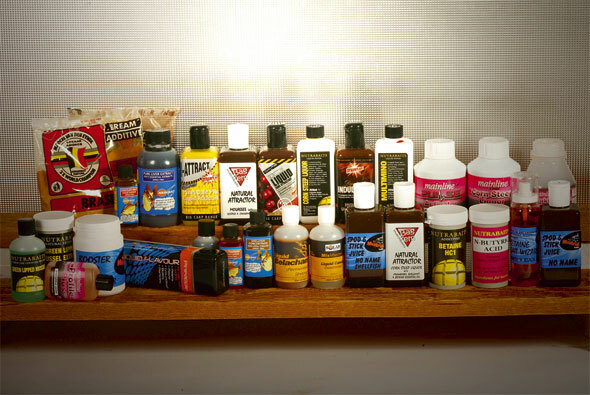 From liquids to sprays and powders, there is an additive for all occasions. There is no argument that these additives give you an edge but how do they work and how do you use them effectively? Flavours work on two levels - instant attraction and long-term appeal. Flavour on the outer edges of the bait disperses as the dosed bait hits the water, it is the initial ‘hit’ that draws fish towards your hookbait. Water-based flavours hang low to the bottom, tempting fish like carp, barbel and bream. Oil-based flavours will rise through the water and attract mid-water fish such as roach. A large portion of the flavour must remain inside the bait, leaking slowly so that it attracts over a longer period of time. It is also important to use flavours or enhancers that boost the taste of a bait. Fish that like eating a particular offering will keep coming back for more, this means your catch rate rises. mixing water for an even spread. right is the soaked one. Cut a tin of meat into cubes, put it in a plastic bag and pour low-concentrate flavour on top. Trap some air in the bag and shake it to ensure all the meat gets a coating of liquid flavour. Fridge the flavoured meat overnight to allow the attractor to penetrate the bait. Get a low-concentrate flavour or bait soak and squirt a teaspoon or two of liquid onto the pellets. Shake the baits to give each one a coating of liquid then leave them to stand for 15 minutes. Soem of the flavour penetrates to boost long term attraction. Unsoaked pellets (far left) with flavour-doused pellets next to them. In the water some flavour is instantly released, more leaks as the pellet collapses. Don't pour neat concentrated boilie flavours on pellets - they could be over-powering to the fish. Several pumps with a flavour spray, like this Richworth one, boosts the instant appeal of your corn when it hits the water. Don't add too much flavour to the kernels as it may put the fish off! Sieve away the maize on the maggots and squirt them with low concentrate flavour. Rub maize meal inside the container (it stops the maggots escaping) and leave for 15 minutes. Dust the maggots with fine maize meal - it sticks to the excess flavour and soaks it up. Rub the maize through the baits to coat them. In water the maize leaks flavour to attract the fish. These maggots were boosted with Van den Eynde Sweet Scopex liquid and are now perfect for bream, carp, roach and tench.